Two finger scroll is exactly what it name suggests: a feature in laptops which you can use to scroll pages by using two fingers. Thanks to this feature, you can scroll pages without using the arrows, and this in result offers greater accessibility and improves ease-of-access. However, sometimes scrolling refuses to work. Typically this problem is seen after the installation of a new Windows version. There are many ways through which you can solve this problem. We’ve listed some common workarounds. It is possible that all of them may not work for you. We suggest you start with the first step listed in the post, and if doesn’t work, go to the second solution and so on. This is a basic fix and has worked for several users. 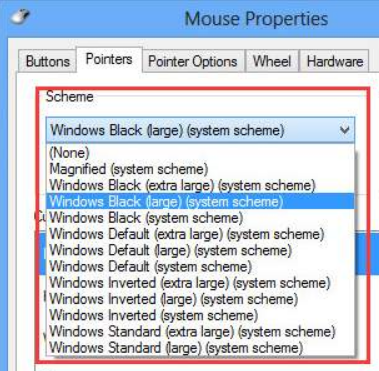 When you change mouse pointer, sometimes it resets the present configuration of the mouse. Here are the steps to follow. Now check if the error is fixed. In case two-finger scrolling is marked as disabled in the pointer settings, of course you can’t use it. Enabling it may solve the problem once and for all. In case you’re still getting the problem after trying the first two solutions, it means there’s something wrong with touchpad drivers. 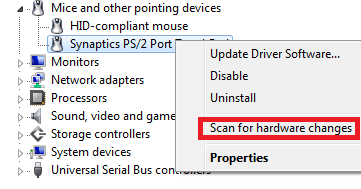 You can uninstall device driver and then let Windows run a scan to detect hardware changes. 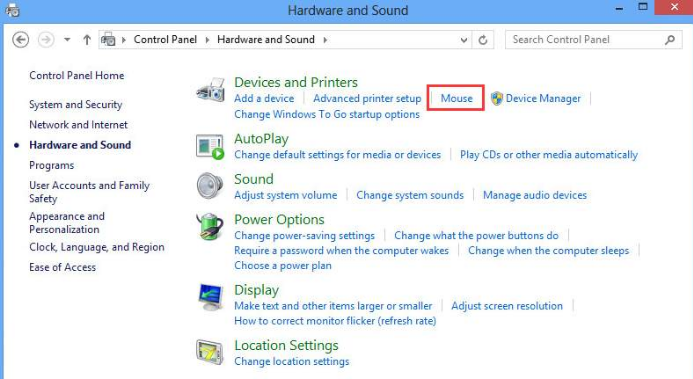 Once Windows detects the hardware, it will automatically install default drivers that are there on your computer. Now see if this issue is fixed. Important – It has been noted that often software like Synaptics or Elan_Touchpad was the root cause of the issue. Therefore, we recommend you uninstall the software through control panel. Then download the newest version of this software and complete its installation. In case the newest version doesn’t function, try to roll back to the earlier version. Then check if the problem is fixed. Because many people were able to solve the issue by doing these steps, try them out before proceeding further. 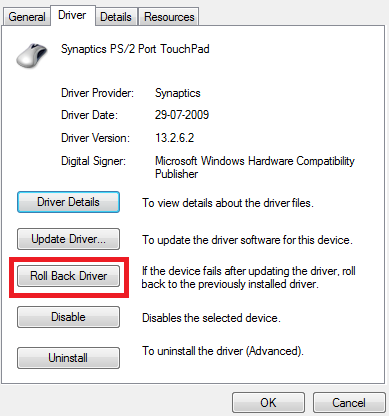 In case the problem is still there, you can try rolling back drivers to the previous version. If that doesn’t fix the issue, update the drivers and check. Here are the steps you need to perform to roll back drivers. If not, you should install the latest drivers. 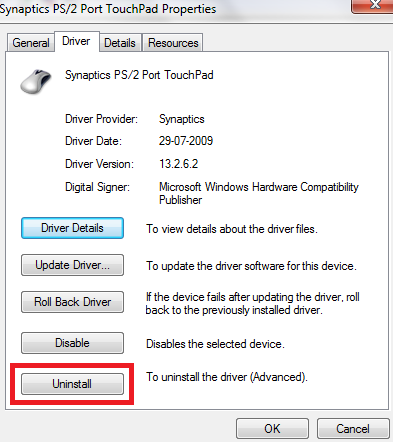 You can do this manually by downloading the newest device driver file from the site of your touchpad manufacturer. Another and much easier way is to use a reliable driver update software tool. We’ll see both the methods. Use advanced driver update software like DriverDownloader to update touchpad driver and other device drivers with utmost ease. To get DriverDownloader, click this green button. Next install the software and register it. 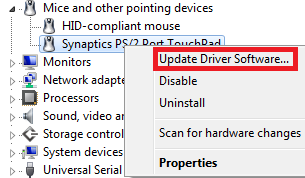 Now DriverDownloader will automatically install the latest Touchpad driver. Yup, it’s that easy and fast. This is the last solution, and it is also the most technical. Registry is an important tool. Making the wrong changes in the Windows registry can make your computer unstable. So try these steps only if you’re confident of using registry editor. Important – You should always make registry backup before editing it. If you have a backup copy, you can undo the changes made and revert to the previous state. To make registry backup, press Win + R, type regedit, and press Enter. This will open the Registry Editor. Click the File menu and then click Import. Save the backup copy in the desired location. To revert to previous state, simple select the Export option in the File menu of Registry Editor and browse to the location where you’ve stored the backup copy. Here’s what you need to do to edit registry values to fix two finger scroll not working issue. Different keys will be present in the right pane. Change these keys as per the guidelines noted below. To make changes, double-click a key and change its value accordingly. Then press the OK button. Now see if the issue is resolved.